Dublin City Council voted to abandon the Poolbeg incinerator project recently. The project, which has already cost the city €96 million, has been embroiled in a contentious battle between local residents in Dublin 4 since its inception as far back as the 1990s. In recent years, the project has become somewhat of an ongoing embarrassment for the City Council. In December 2012 a report, conducted by the Local Government Auditor, found that the Poolbeg project was “weak” and “not adequate”. It slammed the City Council for spiralling consultancy costs that had broken the €24 million mark, which in turn “breached procedure guidelines”. In February of this year, the project faced another disaster after reports surfaced that the City Council had paid €200,000 a month for PR and security at Poolbeg. In January, the City Manager, Owen Keegan, said the Poolbeg project had proved to be “extremely challenging”. 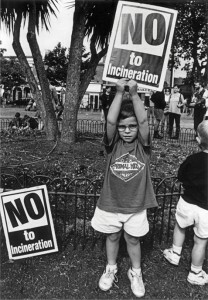 Left: A child protests against the incinerator.